Whether you’re working on skirting boards, furniture or a woodworking project of your own design, a nail gun is an essential tool for driving nails into tough materials. With a large selection of cordless nail guns, we’re sure to have the right tool for you. Perfect for household DIY and upholstery – as well as some work in trade - these 16- and 18-gauge power nail guns are battery-powered for convenience and manoeuvrability. Equipped with single firing and rapid bump mode, these tools can be altered to better suit the task at hand. If you’re not sure which nailer to choose, our Nailer Buying Guide can provide help. As with all products in the ONE+ range, the Ryobi cordless nail guns come with an interchangeable battery as standard, making this an excellent place to begin or extend your collection. Thanks to the Airstrike Technology in the Ryobi nailers stocked by SGS Engineering, you get can an extremely powerful product without the need for large air compressors or expensive air cartridges. If you need to return your goods for any reason, we have a 60 day returns policy. There’s also free next day delivery option. Individual warranty information is listed on each product page. 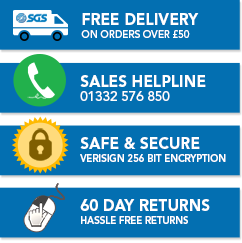 Any further queries can be tackled by our sales team, who will be happy to help via email sales@sgs-engineering.com or phone 01332 576 850. Find the right nail gun for your task with our expert buying guide. Need to know more about your power tool battery options? Take a look at our Ryobi battery tips.